Following a 6-2 start in the Big 12, a first place standing through six and a win over Texas, the encore week hasn’t been all too kind for Kansas. Since, the Jayhawks have suffered back-to-back losses with the latest negative news that setter Camryn Ennis was injured in their most recent outing. In what would turn out to be a three-set loss to Iowa State, Ennis exited the match in the first set due to an ankle injury. She wound up with 1 kill, 1 assist and 1 dig in the limited time. Ennis has been a part of the 6-2 for Kansas with Gabby Simpson since the second week of the season when she took over for Annika Carlson. It’s possible that Carlson regains that role for as long as Ennis is out, although in the match with Iowa State Simpson was the lone setter. Kansas was also held to just 27 assists as a team for the match with Simpson at 21. Standing at 6’0″, Ennis is a freshman outside hitter/setter from San Antonio, Texas where she was an Under Armour Second-Team All-American and the 79th ranked recruit by PrepVolleyball. So far this season she has notched a team-high 437 assists (6.52 per set) to go with 164 digs (2.45 per set), 43 kills (0.64 per set), 40 blocks (0.6 per set) and 14 aces (0.21 per set). 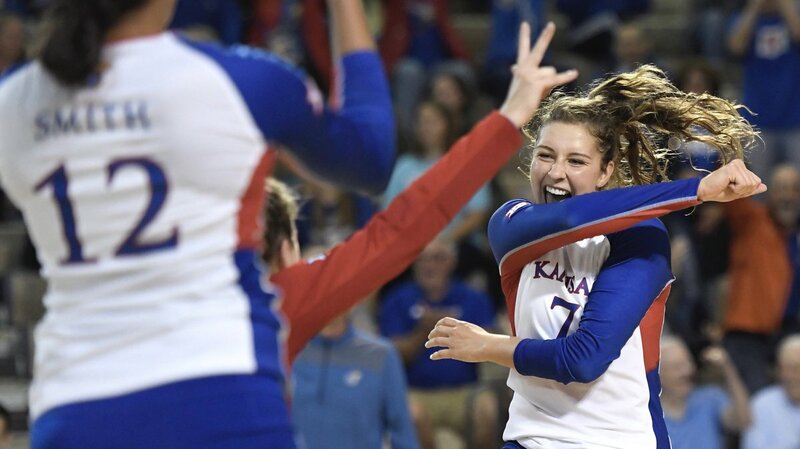 Kansas, currently ranked 19th in the latest VolleyMob Top 25 Power Rankings, is 13-6 overall and 6-2 in league play following their week of results. They’ll continue action with a one-match week as they travel to Baylor next Saturday.